SAN JOSE, CA, OCTOBER 18, 2004 - Twin Communications of America (Nobuharu Hiruma, President and CEO) announced today that it has released Twincommunicator which is a unique and compact BUS controller that attaches to a Palm(TM) PDA. Twincommunicator can run continuously for over 8 hours on 4 AA batteries. The small and lightweight Twincommunicator is a highly functional BUS controller that performs well as both an I2C BUS monitor and a video signal generator. Twincommunicator is design with portability in mind. It is battery powered and driven by the ease of use of Palm user interface. Twincommunicator can be used anytime, anywhere. I2C BUS is a well known internal BUS that is commonly used in modern digital products, e.g. TVs, home appliances, etc. Twincommunicator can play a significant role in design and development of such products. Furthermore, Twincommunicator has a built-in video signal generator. This allows TV adjustments and repairs to be done with ease using the same Twincommunicator. It has an easy and intuitive user interface utilizing touch panel and high density LCD panel. This results in drastic improvements in design, efficiency during tests, and reductions of operational mistakes. It is as simple as tapping icons and buttons on the screen. As it is battery operated, it is modular and can be used anywhere. With 4 AA batteries, it can run continuously for over 8 hours when video signals are generated. It can be used for field tests, services, and onsite demonstration at customer homes even when AC power source is not available. It has built-in 27 common video patterns in its memory. Since it has the patterns internally, the display speed is fast (1-3 seconds). You can create your own video patterns and store them in the PDA's external storage card. Creating original video patterns is very easy. You only need to create bitmap files in specified size and store them in the specified folder. This feature allows you to display any kind of video patterns such as pictures taken by a digital camera. 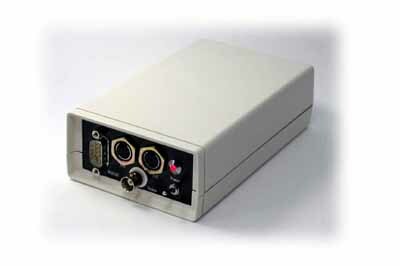 It generates both NTSC and PAL video signals. The I2C BUS monitoring function and the video signal generating function work independently. This dual functionality allows you to control I2C BUS and generate video signals at the same time. Since it has a general purpose serial interface, it can be used with any PC equipped with a serial port. The application for Windows 2000/XP is also provided. *Twincommunicator is a trademark of Twin Communications of America, Inc.
*Windows and Windows 2000/XP are registered trademarks of Microsoft Corporation. *Palm is a trademark of PalmSource, Inc.
*I2C BUS is a trademark of Philips. *CLIE is a trademark of Sony. *All other products and brand names may be trademarks or registered trademarks of their respective owners. Twin Communications of America, a privately held company based in San Jose, California designs and develops cost-effective software and hardware solutions for the mobile device markets. Twin Communications of America, Inc.